You bought a company. Now what? Unprecedented challenge urges alumni to "Meet Us at a Million"
New Hope Ecotech, a recycling startup created by Dean’s Scholarship recipient Thaigo Pinto ’15, connects people in poverty with tradable environmental securities, spurring positive change in their lives, their communities and the health of the planet. MATTER, a med-tech incubator co-founded by Kellogg Clinical Assistant Professor of Innovation and Entrepreneurship David Schonthal ’09, matches industry players to drive medical and healthcare breakthroughs. Competition to attract talent like this has never been greater. And Kellogg’s Annual Fund makes it possible to continue to attract the best and brightest students, and fund faculty research and endeavors. Inspired by their own Kellogg experience and the school’s bold future plans, 10 distinguished alumni — recent graduates and seasoned luminaries, alike — have established an unprecedented philanthropic challenge for the school’s Annual Fund. 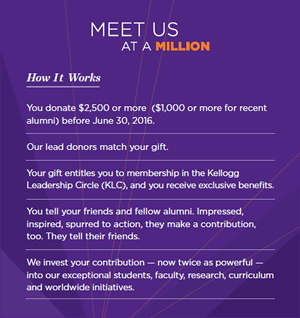 They’ve launched the “Meet us at a Million Challenge,” pledging to match any Kellogg Leadership Circle gift ($2,500 and up, $1,000 and up for recent alumni), up to an additional $1 million between May 21 and June 30. The goal is to generate $2 million in impact for the Annual Fund. “The day before I was going to have to drop out of Kellogg because I didn’t have any money, the school gave me a loan that enabled me to complete my degree,” says Keith Rozolis ’83, one of the lead donors and president & CEO of ABC Supply Co. “Like so many of our alumni, someone invested in me, and I wouldn’t be where I am today if they had not. Annual Fund support provides scholarships for exceptional students, supports trailblazing faculty, drives game-changing research and spurs global innovation. It is a great way to give back and invest in the future of Kellogg. Deepest gratitude to the generosity of our 10 lead donors: Catherine ’94 and Gary Briggs ’89, Rich Byrne ’85, Guangfu Cui ’03, Bon French ’76, Bill Hayes ’91, Jenny Lee ’01, Carlos Guillermo Leon ’94, Keith Rozolis ’83, Bruce Spohler ’86 and an anonymous donor.